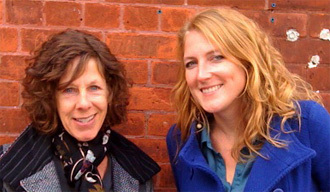 In this age of busy parents, fast food and disgruntled children, mother and daughter authors Holly Wojahn and Kirby Fopma, have written a delightful short story for children that will enchant and educate all who read it. The story begins with our heroine, Bridget, who has just finished her dinner of meatloaf, creamy mashed potatoes and broccoli. Eagerly awaiting her dessert (she is hoping for pie) she is brought blue jello - again. Before she knows it, she is whisked away on a magical gourmet trip visiting England, Ireland, Mexico, Japan, Australia and many other countries - this is truly an international adventure. if you offer a bit of your tiramisu. 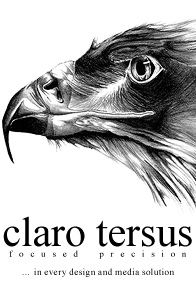 and the accompanying full page illustrations are whimsical and clever, not to mention exceedingly well drawn. But the book’s ultimate triumph is introducing the reader to new desserts, words and cultures, opening the child’s imagination to what lays beyond their home, street and town. "While in snowy Norway, the land of the Viking, I tried creamy Trollkrem, which was much to my liking." Bridget ultimately returns not only with expanded culinary tastes, but with a newfound appreciation for what she had previously found mundane - such as her blue jello. The book comes complete with a short glossary and a CD that contains seven catchy songs, that will both delight and entertain. These were written by Holly’s brothers Roger and Scott Wojahn - making Bon Bon Voyage a truly family affair. Holly Wojahn is also an accomplished painter and her art has appeared in renowned galleries around the world, including Galerie Breheret in Paris. 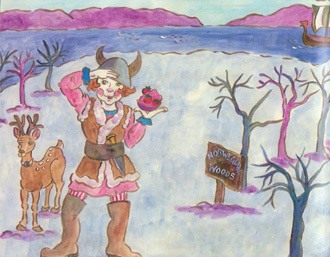 Holly has painted all of the illustrations in Bon Bon Voyage. This last weekend, Holly and Kirby visited the Hickory Stick Bookshop in Washington Depot, CT for a book signing and reading. Some of Holly’s artwork can be seen next door, until April 8, 2011 at Marty’s Cafe. With its attention to detail, delightful tale and amazing illustrations, where something new can be found every time you look, Bon Bon Voyage is highly recommended. 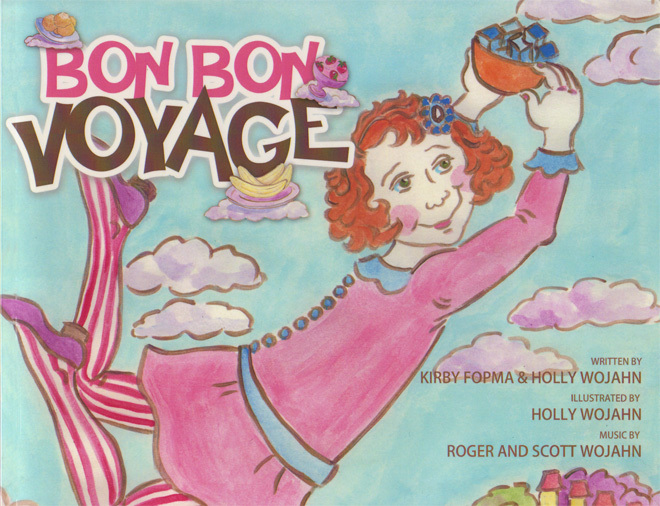 Bon Bon Voyage ($16.95) can be bought, and further details obtained, from the Bon Bon Voyage website. All images that accompany this article are copyright their respective owners.